ReSTNSX's Migration Assistance Tool (M.A.T.) is a virtual appliance built to automate the migration of NSX-v configurations to NSX-T. In four easy steps, customers can migrate one or many NSX-v environments to NSX-T. Up to 12 NSX-v instances can be migrated to NSX-T on a single appliance. Licensing is enforced per NSX-v data source. 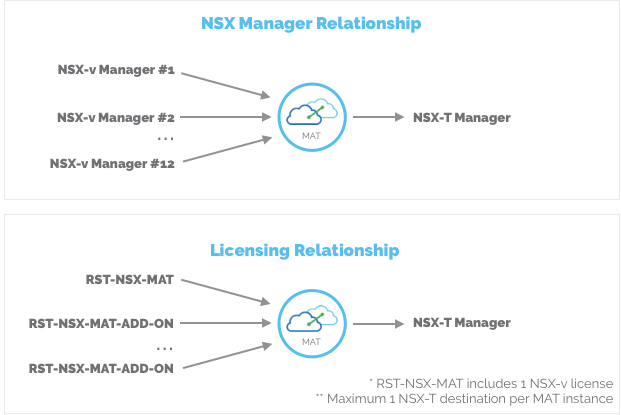 For every NSX-v Manager being migrated, a corresponding license of MAT is required. If multiple NSX-T environments exist, you will need to license each separately with an additional base SKU of RST-NSX-MAT. Need help getting your environment migrated? Leverage the expertise of the ReSTNSX team to review the existing NSX-v configurations; build the NSX-T base environment and perform the migration. Our team can work on an hourly basis or SoW-based engagement. Below is an example of our hourly SKUs that can be used towards your NSX-T migration. Explore MAT with an online demo. We will cover supported migration scenarios and run through a live -v to -T migration of Micro-segmentation and Network Virtualization. Demos are typically 30 minutes or less and can be scheduled using our request form. Purchase software, support and professional services through our partner network. Ordering of MAT is available through the same partners who resell other VMware technologies such as NSX. In addition, VMware sales teams can add ReSTNSX SKUs to NSX quotes fulfilled by both distributors.